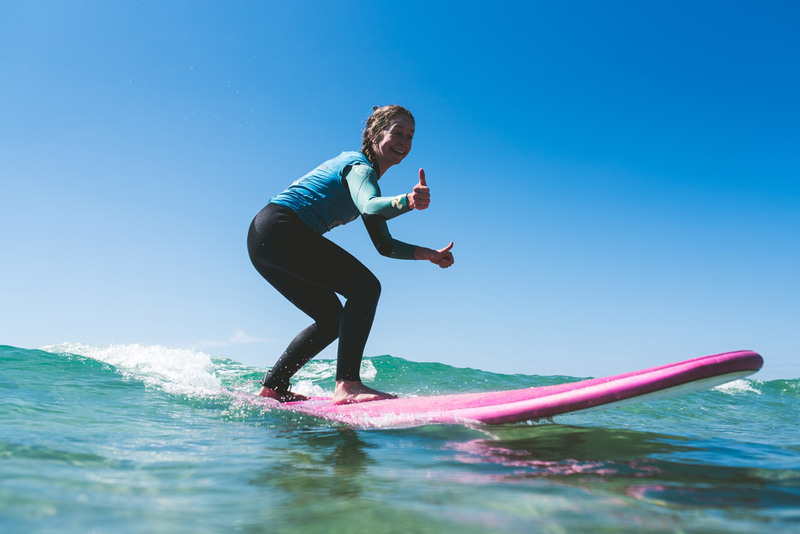 As a beginner, our surf classes will teach you the basics of surf as a sport. You’re supposed to be able to swim. Even if you’ve never seen the sea before, we guarantee that we will make you stand on a board and be able to surf a wave. That is our commitment and our mission in Baleal Surf School. You will learn how to handle the board in the water, where you should position yourself at sea, how to lie on the board, how to paddle to catch your waves, and how to stand. You will also learn techniques to clear the break-point and surge to the crest of the wave. Undoubtedly, this is the major stage in the process of learning to surf. It is essential that you consolidate these early skills in order to correctly develop your surfing skills and to be able to grow in the future. One of the most relevant issues is also learning how to read the condition of the sea, since it is the sea you’ll be surfing. It is also essential to learn about safety rules to prevent any type of accident. Only this way you will be able to enjoy the unique sensation of being able “to glide on the sea being powered by a wave” in all tranquillity. In Baleal Surf School we try as much as we can to separate our surf students accordingly to their level. That’s why on the first day of your surf classe we make an assessment to verify in which level you stand and eventually relocate you to a different group with similar level. To be part of the intermediate surf classe, you’re supposed to have surfed before and to be able to stand on the board on most of your attempts. You’re also supposed to be able to paddle up to the waves, which should not exceed one metre or, at the most, not rise further than your chest. At this stage in your progress, you will learn to take the drop when surfing green waves and to descend to the base of the wave. The most important manoeuvre at this stage, preceding all others, is to be able to do a bottom turn, i.e., to turn at the base of the wave. Only when you are skilled at this technique will you be able to progress to other types of manoeuvres such as the off-the-lip, the cutback and floater, and other man oeuvres. We will teach you to select the right type of board for you at this stage, by covering the materials that are used for board construction as well as covering board shapes, i.e., the various types of surfboard cut and their functionality. You need to take into consideration that for every surfer there is a type of board that is adequate to his or her level of skill, in addition to his or her particular weight and height. The type of wave on which you will be practising your skills is equally of major importance for your progress. For the intermediate surf course it is also important to learn how to select the right wave to do your first manoeuvres, and thus be able to improve your surfing abilities, are also taken into account.